Considerable media attention has focused on the recently passed UN Security Council (UNSC) resolution, which forcefully condemned Israel, as well as the speech by outgoing Secretary of State John Kerry, who attacked the Jewish state and assaulted its very legitimacy. Both represent the wrong path to peace. The Israeli government, politicians across the political spectrum and the Israeli people were outraged and felt betrayed by its most trusted ally. Naturally, Palestinian Authority President Mahmoud Abbas welcomed the resolution, which was also celebrated by both Hamas and Islamic Jihad terror groups. 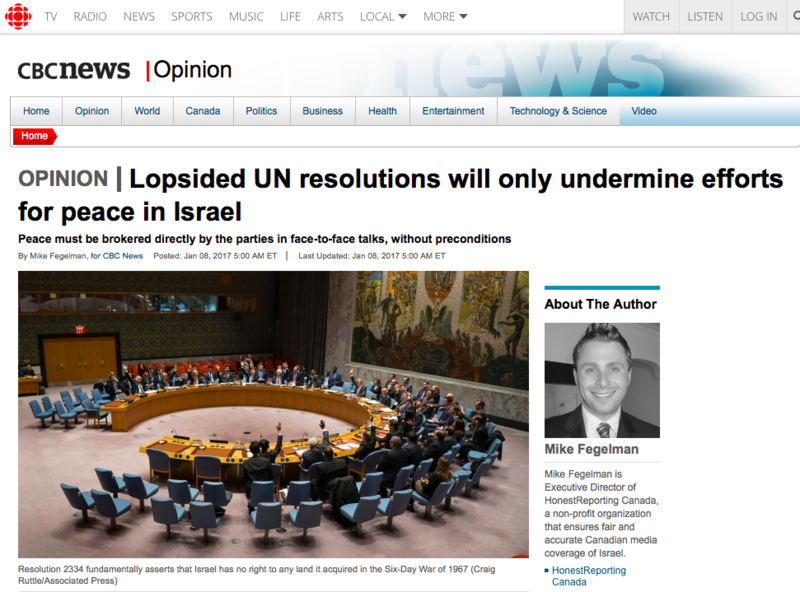 Any pretense that the resolution was fair and balanced can be thrown out the window when organizations committed to Israel’s destruction and the genocide of Jews laud its passage. Why did Resolution 2334 hit a nerve? At its core, the resolution – which Israel claims was orchestrated by the Obama administration – made outrageous assertions, including that the Jewish Quarter in the Old City, Jewish neighbourhoods in Eastern Jerusalem and the Temple Mount and Western Wall complex (Judaism’s holiest sites) are “occupied” Palestinian territory, even though the Palestinians have never been sovereign rulers of the land. With the stroke of a pen by the UNSC, 3,000 years of Jewish connections to the land of Israel were effectively crossed out. Resolution 2334 fundamentally asserts that Israel has no right to any land it acquired in the Six-Day War of 1967, and that any Israeli presence in areas beyond the 1949 armistice lines is a violation of international law. To many international observers, the Oslo Accords and its paradigm of land for peace was jeopardized, as any lands Israel could concede and use in negotiations as bargaining chips have de facto been designated sovereign Palestinian territories. So, why should the Palestinians negotiate for peace, when they are able to extract concessions through unilateral means? According to the prevailing media narrative, Israel and its settlement policies are deemed to be the primary obstacles to Mideast peace, and Israel is scuttling the prospects for a two-state solution. Though Israel hasn’t actually built a new settlement in many years, the expansion of existing settlements — to account for the natural growth of Israelis living there — are deemed impediments. Would the world rather Israel impose a quota on births in young Israeli families until the Palestinians agree to negotiate peace? As secretary of state, Hillary Clinton described Israel’s 10-month moratorium on settlement building in the West Bank back in 2009 and 2010 as “unprecedented.” The settlement freeze was done at President Barack Obama’s behest (not a request originally made by the Palestinians, but now is their precondition to negotiations), but even that did not bring the Palestinians to the negotiating table, nor did they stop the terror attacks and incitement to violence. (Clinton later called the settlement freeze demand a “tactical mistake.”) That came as no surprise: Israel’s withdrawal from Gaza in 2005 didn’t produce peace, and instead, thousands of rockets have been fired at Israeli cities, and Hamas continued to dig underground terror-attack tunnels that led to war in 2014. Untold in the resolution — and only obliquely acknowledged in Kerry’s 72-minute tirade — is how the Palestinian failure to recognize Israel as a Jewish state, and to affirm the right of Jews to self-determination in their ancestral homeland, acts as a persistent barrier to Mideast peace. Israel desperately wants peace, and since 2000, it has made three generous peace offers, all of which were ceremoniously rejected by the Palestinians without a counteroffer. Even when faced with unrelenting Palestinian rocket fire, shooting rampages and knife attacks — which have killed 42 people in the last 15 months — Israel has steadfastly supported the two states for two peoples concept. In 2011, President Obama rightly said that UN resolutions should never dictate the terms and contours of Mideast peace, nor should the American administration impose a solution. Instead, peace must be brokered directly by the parties in face-to-face talks, without preconditions. In recognition of the resolution’s unfair targeting of Israel, the U.S. House Of Representatives recently passed a bipartisan motion repudiating the resolution, by a wide margin of 342-80. Going forward, President-elect Trump, congressional leaders from both the Democratic and Republican parties, Prime Minister Justin Trudeau and others in the international community must continue to push for direct face-to-face peace talks. At the same time, this lopsided resolution must be repealed and repudiated. Threats to haul Israelis to the International Criminal Court, to encourage anti-Israel lawfare and to embolden boycott, divestment and sanctions campaigns must be confronted head-on. An enduring peace must be built from the ground up, rather than from the top down. Make no mistake, to see to Mideast peace, the Palestinians must recognize the Jewish nation state’s right to exist, and unequivocally disavow terror. 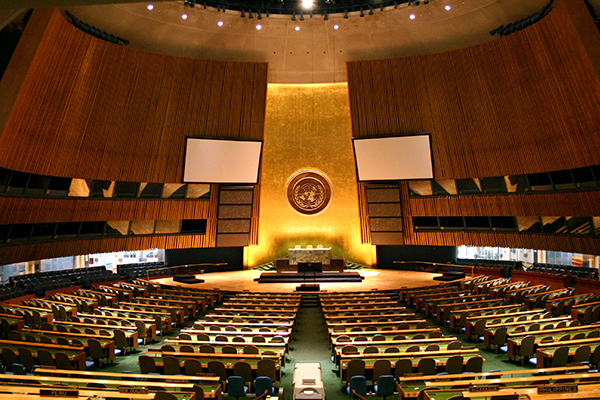 Any further efforts to demonize and delegitimize Israel at the United Nations and elsewhere will only undermine negotiations.